Subscribe to Entertainment Weekly Magazine at a discount. Save money when you compare prices and subscribe or renew online. 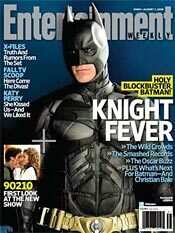 Entertainment Weekly magazine gives you a front row seat for the latest on movies, TV, music and more. Each issue of Entertainment Weekly goes behind the scenes to deliver you the buzz, the biz, reviews and award-winning entertainment news. DEAL ALERT! Order now to get this outstanding value on Entertainment Weekly Magazine! Entertainment Weekly is the only national magazine providing weekly coverage of all the popular arts. Looking for gift ideas? Why not give a gift subscription? You can subscribe online and you can even renew a subscription. Best of all ... you subscribe once but the magazine "keeps on giving" for a full year. Can I order a subscription renewal? You can order a renewal subscription as easily as ordering a new subscription. The key when placing your renewal order is to use the exact same name and address that appears on your current subscription so the publisher knows to extend your current subscription rather than start a new subscription. Some merchants allow you to specify that your order is a "renewal" during the checkout process. Why does it take so long for a magazine subscription to start? One of the strange things about magazine subscriptions is that they seem to take "forever" before you receive the first issue. This is why you can often request a free gift card when you subscribe to let the recipients know they will be receiving your gift subscription soon. Magazine publishers determine their print quantities and assemble their mailing lists far in advance. In general, you should allow at least 6 weeks to receive the first issue of a weekly magazine, and 8 or 12 weeks for a monthly magazine. If you haven't received your first issue within 12 weeks, then you may want to contact the customer service department at the merchant where you placed your order.